I'm not really one for getting excited about new foundation launches, especially if it's from a high-end brand as it will probably be a little out of my price range. But if a brand is offering samples of their new launch then I'll more than likely give it a try. I was a little intrigued by Yves Saint Laurent's new Fusion Ink foundation so I popped along to a counter to be colour matched for a 7 day sample. Lets just say I fell in love and I couldn't resist buying a bottle last week. I was a little concerned when I went to be colour matched as the lady on the counter did this over the top of the foundation I had on. I've never actually been colour matched before (gasp!) so I don't know if this is normal or not. Also instead of telling me which shade was the best match she just gave me a mirror and asked me which one I thought was best. But anyway I went for BR20 (rosy beige) and this appears to be a perfect match for me. This comes in YSL's typical gold box and inside you'll find a rectangular bottle that I believe is made from glass. Although the bottle has a black design to it I'm glad to see they've left see through panels all around the bottle so you can see how much is left. The gold top pulls off to reveal a smaller black lid, very similar to what you'd find on a nail varnish bottle. 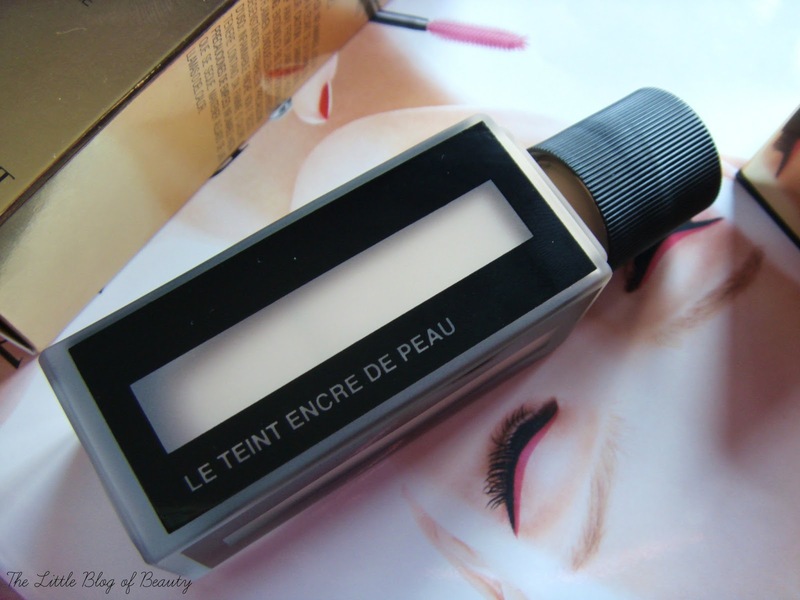 This then unscrews and allows you to pull out YSL's first quill applicator. The little sample pot I had also came with a smaller version of this quill applicator and I have to admit at first I was really confused as to how to use it. I tried dabbing it on the back of my hand and then using my brush to pick some up to apply to my face, but I found that this did waste product as there was always a little left behind on my hand that I had to wipe away. So I've now moved onto to applying this straight to my face, which appears to be the method recommended by YSL. In the little booklet that comes in the box there's a diagram with directions for the perfect dose. 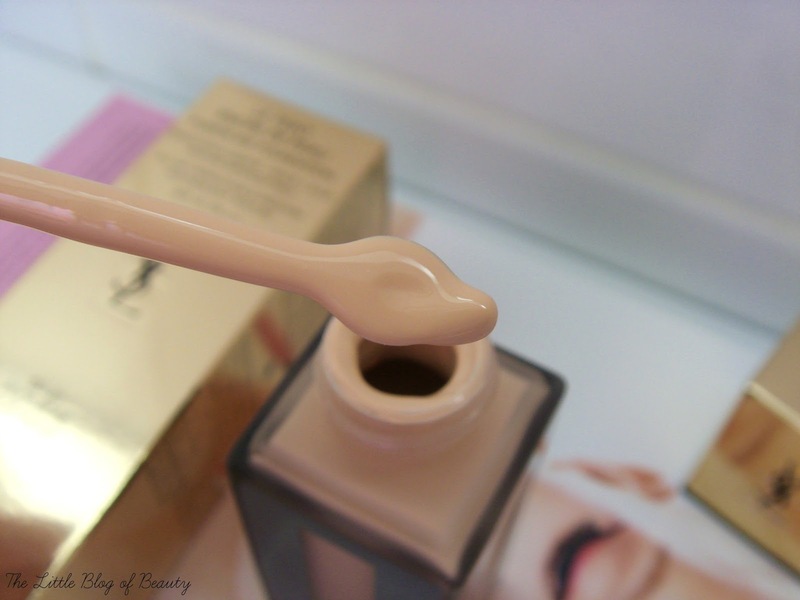 YSL recommend that you 'drop the applicator', which I assume means dip it in the foundation, and apply two stripes to your forehead and one on the bridge of your nose. You should then drop/dip the applicator again and apply one stripe each to the upper cheeks, one stripe each to the lower cheeks and one on the chin (although in the booklet they have shin!). You then buff in with a brush or use your fingers if you prefer. 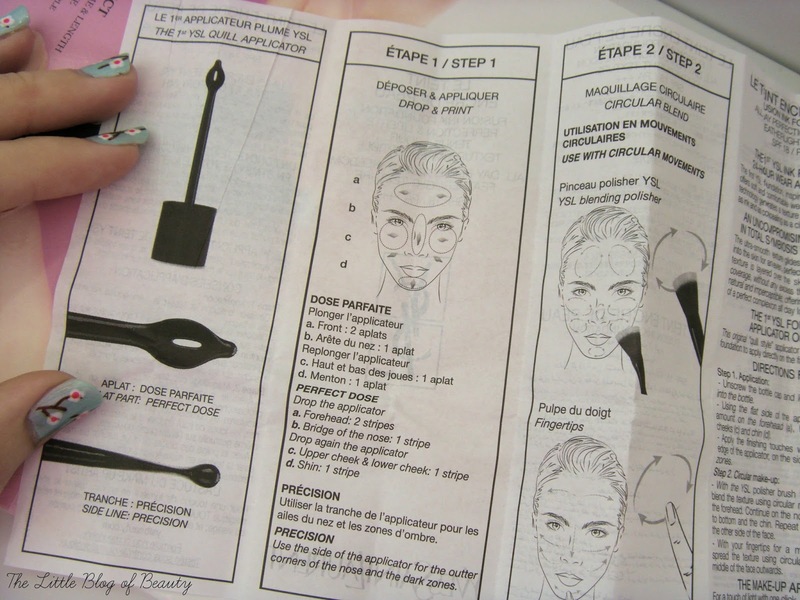 They also recommend using the side of the applicator for areas like around the nose. I'm not sure what level of coverage this is supposed to provide but I would say it's medium build-able and it contains SPF18. I know there's some fancy NASA related technology behind this foundation but I'm afraid I don't really know anything about this. I think it's something to do with making it very light but so it stays in place without the need for primer or powder. This definitely is very light, almost more like a BB cream than a foundation, but yet it has great coverage. It buffs in beautifully with my Real Techniques Expert face brush and is pretty much undetectable, it looks like my skin but so much better. I love that it does well in covering the bits that you want covered but yet still lets your skin shine through. I do use concealer with this because I do have a lot to cover, including dark circles, redness and scaring, and anything short of full coverage needs a helping hand. It leaves a soft matte finish but I find it also still has a slight glow to it. I do use a primer and powder with this and it stays put all day. I haven't tried applying it without primer or powder but I think you could definitely get away without at least powder, especially if you have dry skin like me, but I'm not sure about if your skin is particularly oily. My chin does like to get oily when I wear foundation and although this holds off the oil for a lot longer than normal I do still sometimes have to use a blotting sheet later in the day. This really is a beautiful foundation and I think it's probably the best one I've ever tried. It is a little pricey at £30.50, but I would say it is most definitely worth it. 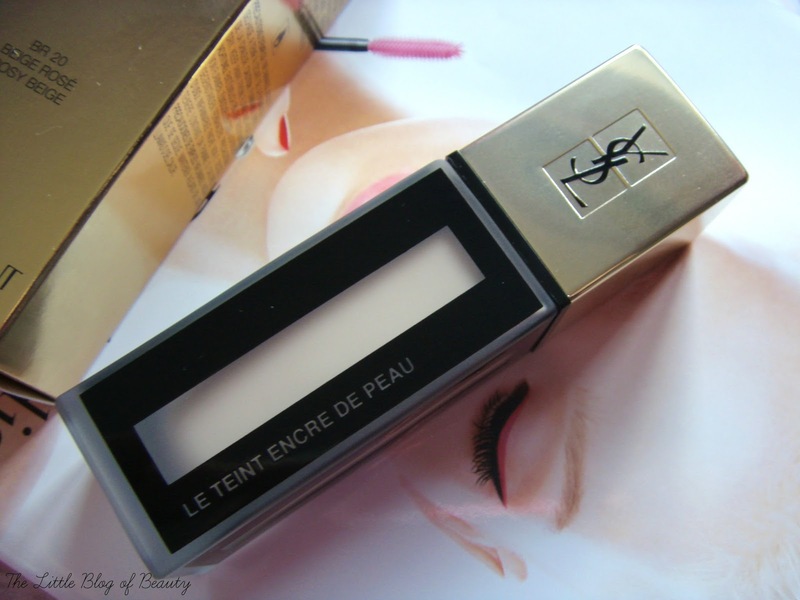 You can find the YSL Fusion Ink foundation on the YSL website and on counters in Boots and department stores. Have you tried the Fusion Ink foundation? Sounds amazing! I love the packaging, so gorgeous!